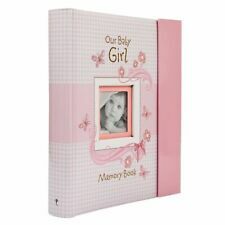 2 Occasions Gift Giving - Baby Girl Photo Album Holds 72 (4"
Top the book off with a too-cute polka dot design and it's the perfect book for your little girl! Add baby's adorable 3.5" x 3.5" photo to the front of this book for that extra special touch. Cherish every laugh, crawl, walk, and more. New ListingBaby Memory Book for Boys First Five Years, Record Your Child's Development in..
With our dynamic pricing model, our prices are always competitive. Item MPN: Does not apply. You're already purchasing the item. The chevron pattern on the front adds a cool touch to this baby book. The book is bound in a rich, blue and white cloth adding an adorable touch for your baby’s nursery or any bookshelf. Your baby’s skin will never even touch the ink so it’s 100% baby safe! Top the book off with a too-cute polka dot design and it's the perfect book for your little adventurer! Add baby's adorable 3" x 3" photo to the front of this book for that extra special touch. Cherish every laugh, crawl, walk, and more. Modern, chevron book cloth cover with binding and openings for both your baby's 3” x 3” photo and one handprint or footprint. The chevron pattern on the front adds a cool touch to this baby book. The book is bound in a rich, blue and white cloth adding an adorable touch for your baby’s nursery or any bookshelf. My Arrival. Family Tree. Our Family Photos. 100% AUTHENTIC. Display baby's 4"x5" sonogram photo on the front cover of this stylish baby book. White, black, and gold foil colors decorate the front of this baby book with "hello baby" and a modern arrow design stamped in gold foil. This is a beautiful full-color Baby Record Book with 64 pages to fill out. Record the milestones in your baby's life from birth to seven years. Cute sayings and Bible verses are sprinkled throughout. Holds 200 4" x 6" photos. Displays two photos per page. It’s also a great baby shower gift to give anyone expecting a little one. Easily create your baby's precious print with Pearhead’s clean-touch ink pad ensuring baby's piggies never touch the ink. This Book does not have an Ink Pad! my baby shower. grow baby grow! sleep baby sleep! eat baby eat! my family tree. these are a few of my favorite things. my first photoshoot. Baby Boy Photo Album with Bear Picture and White Ribbon. Space to place baby's picture on cover. Create a keepsake for generations to enjoy with this Lil' Peach Chevron Baby Memory Book! Record baby's milestones with this journal and album in one. The pink and white cover features a chevron design with ribbon accent, and an opening for baby's photo. This guided journal and album makes an excellent baby shower gift or gift for new parents and grandparents. Baby Record Book measures 10.75 inches by 9 inches Color: pink and white 46 fill-in journal pages to record memories Cover features a ribbon accent and an opening for one 3 inch by 3 inch photo Record baby's cherished milestones with this journal and album in one Acid-free pages preserve your photos Comes with a clear plastic protective cover. The copyrite date inside is 1951. All pages are not pictured, but it does go to age 7. 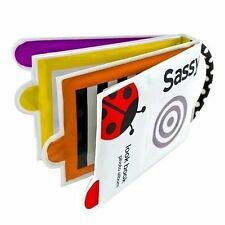 Includes ten (10) 8" x 8" top loading vinyl page protectors with 10 heavy white paper inserts. CD pocket included / Expandable. I usually answer right away. Having a personalized book makes each child feel special. This book is special because. At Lil' Peach we aim to create genuine, quality products to. Lil' Peach team works together seamlessly every step of the way. Whether your. Fun and vibrant, our baby book. your precious baby's milestones. Best baby books for boys or girls, newborn infants little babies & toddlers, twins. Pink blossom pattern, ribbon trim on cover, friendly animal character illustrations throughout. Section devoted to baby shower, guests, gifts, invitation. Carters Baby Memory Book, Safari Animals- New In Box. CARTERS BABY MEMORY BOOK- SAFARI ANIMALS- NIB. Please see picture for outside plastic packaging condition. Actual item is new and excellent condition. Style:Cute Baby Educational Donkey Cloth Book. Size:Book size 22x11cm/8.6"-4.3". Color:As Picture Show. Three 100 Page Photo Albums. Baby's Third Year. Baby's Second Year. Book contains 84 pages. Length: 11 1/4". The chevron pattern on the front adds a cool touch to this baby book. The book is bound in a rich, blue and white cloth adding an adorable touch for your baby’s nursery or any bookshelf. This baby book also includes a clean-touch ink pad to display your little one’s tiny print on the cover. Trending at $19.19eBay determines this price through a machine learned model of the product's sale prices within the last 90 days. Celebrate milestone and special events in your little one's first year with these adorable, two-sided milestone cards featuring the sweet and stylish Minnie Mouse. Set includes 12 milestone cards with prints on both sides featuring monthly and special milestone occasions with Disney's Minnie Mouse. There are 4 albums for 0-3 months, 3-6 months, 6-9 months and 9-12 months. A perfect gift for any parent! It is not seen when facing the album set from the front. Baby book -- First 5 Years. The 'My First Year' Baby Album features a front collage cover that can hold 13 photos of every month of your Baby's First Year. The top of the album has the words 'My First Year' and a rattle, rocking horse, pair of shoes and a bottle are featured in the corners of the front cover as a raised image.Inside Album holds 240 photos of Baby's First Year! The Lil' Peach Chevron Baby Book is the perfect way to record your precious baby's milestones. The cover includes a ribbon accent and an opening for your baby's 3" x 3" photo. Cherish every laugh, crawl, walk, and more. Diney Claiss Winnie the Pooh Photo Album or Scrapbook - NEW! The size of the pages inside are 8" X 8". Size of the album is 8.5" x 9". Super cute Classic Pooh! This photo or scrapbook album has 10 pages in it to place your pictures or scrapbooking ideas! Baby Briefcase Paperwork Organizer Shower/Newborn Gift NEW. Condition is New. Contains: Sturdy Plastic briefcase 9 durable frosted plastic folders 6 baby vital info wallet cards Pretty filing labels Thank you note tracker Phone & name tag pockets Fits into standard file cabinets! Keep 72 of your favorite 4" x 6" photos of baby girl in this attractive photo album. The heavy cardboard cover is diecut "Baby Girl" and placed over a decorative sheet for a fun effect. Your album is gift boxed and ready for giving. GIRL PINK BABY BOOK. BABY'S FIRST YEAR CALENDAR. Cherish all of baby's moments with Pearhead's Chevron Photo Album Display favorite 3 x 3 inch photo of your little one Includes 50 acid free pages and space to write a note or memory next to each picture Book can hold up to 200 pictures on your little one and includes room to write a note or memory next to each picture Photo album measures 9''W x 8.6''H x 2''D . Set includes 12 milestone cards with prints on both sides featuring monthly and special milestone occasions with Disney's Mickey Mouse. Capture all those special firsts alongside the playful spirit of Disney's Mickey Mouse. Book is in good condition. Book has 85 pages of illustrations and record keeping space. However, mistakes can happen. We are imperfect humans. I do research the internet and books to get as much information as I can. I employ a 3 step inspection process to help reduce this risk. We want you to have a pleasant experience and will work with you to ensure this happens. Korean baby fabric (cloth) Books (2 Books). Condition is very good Used. This book comes from very well known good Korean publishing company called ‘Apple bee’ and they are famouse for kids books in Korea. These are Korean peekaboo fabric books. Mint condition. Each page has hidden animal that baby can open and see. There is rattle sound from each page. Machine washable. Colorful. Lots of fun. Ships from USA. FEATURES PALE GREEN CLOTH COVER WITH A SWEET FUZZY PLUSH EASTER BUNNY AND 3 DECORATED EASTER EGGS - BABY'S FIRST EASTER PHOTOS TEXT UNDERNEATH. BABY ESSENTIALS BABY'S FIRST EASTER PHOTO ALBUM. HOLDS 100 4" X 6" PHOTOS. White and Blue Baby Boy Photo Album-4x6 Photos As Shown. Parents use baby memory books and photo albums to create keepsakes of their baby boy or girl. Filling out a baby memory book with photographs, thoughts, and little mementos give you a way to preserve sweet memories of your babies. It is also a great way to share these precious times with family and friends. What is a baby memory book? 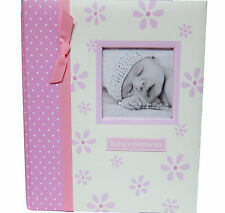 A baby memory book is a type of photo album and scrapbook for your baby. It combines journaling, photos, keepsakes, and decorative elements like pattern papers and ribbons. It's similar to a personal scrapbook. It saves the memories of the baby's first year, showing off special times like your baby's first Christmas or first haircut. Baby memory books, along with baby photo albums, make a thoughtful gift for baby showers. What is a baby brag book? 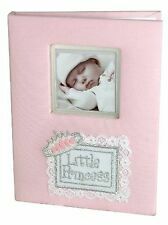 A baby brag book is a small photo album filled with baby pictures that family members can use to show off the baby girl or boy to friends and co-workers. The size of a brag book is big enough to fit a regular-sized photograph but portable enough to carry around in a purse. What are brands of baby photo albums and memory books? You can find several different companies that produce baby books. CR Gibson: This company's line of baby memory books includes girls', boys', and unisex styles. They help the parent preserve memories by creating pages that encourage saving milestones with photographs or journaling. Carter’s: These memory books include many pages which will encourage parents to fill them out. The pages are decorated with cute baby themes like monkeys and nautical images. Normson: This brand's memory books include the first five years of your child's life. Some of the pages have pockets to place pictures your little one has drawn, as well as other keepsakes. Pearhead: This brand makes books in pink, blue, and neutral colors. The memory books are hardbound and let you take your baby's handprint and footprint. How can you use your baby book? Having a place for all of your baby's special moments and keepsakes will help you save and enjoy them throughout the child’s lifetime. You can make the most of your baby's memory book by planning how you will use the special pages. When you prepare for memorable times, you will have what you need to capture the moment. You don't want to forget your camera, so you can take pictures of key moments, like a first haircut. To be prepared for any moment that you may want to treasure, make a list of all of the pages you would like to fill out in the baby's memory book. Carry your camera and a notebook with you when you and your baby go out, or keep these items in a handy space at home. This way you will never be caught off-guard during a precious moment.